Presented by Dr. Matoso and prepared by Austin McCuiston. 43 yo female with kidney tumor. Histology: This tumor is composed of primitive tubules with scattered poorly formed papillary structures and cord of cells with round nuclei, inconspicuous nucleoli and scant amount of cytoplasm. 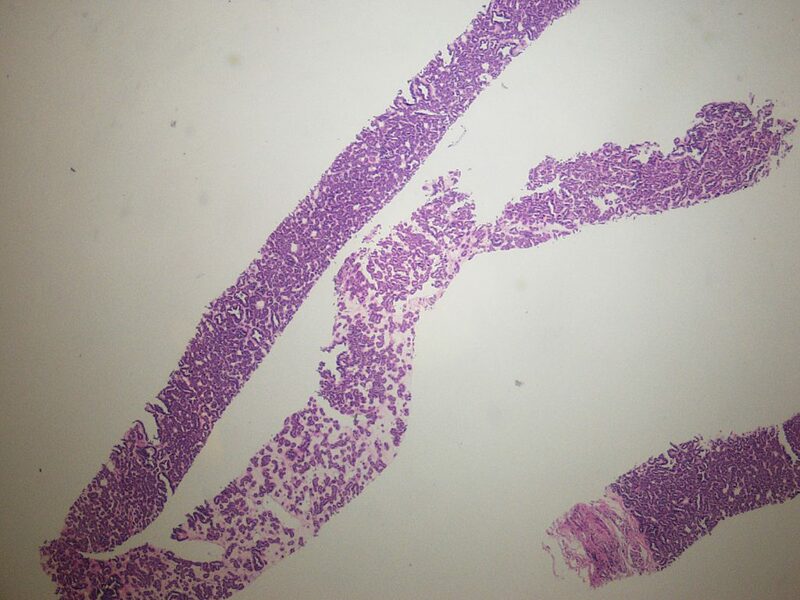 There is no mitotic activity, or tumor necrosis. Discussion: This is an example of metanephric adenoma. These tumors show a female predominance and can happen at any age. They are usually non-encapsulated but this feature might not be evident in a needle biopsy as seen in this case. Psammomatous calcifications could be seen and the presence of necrosis or hemorrhage is rare and does not equate malignancy. 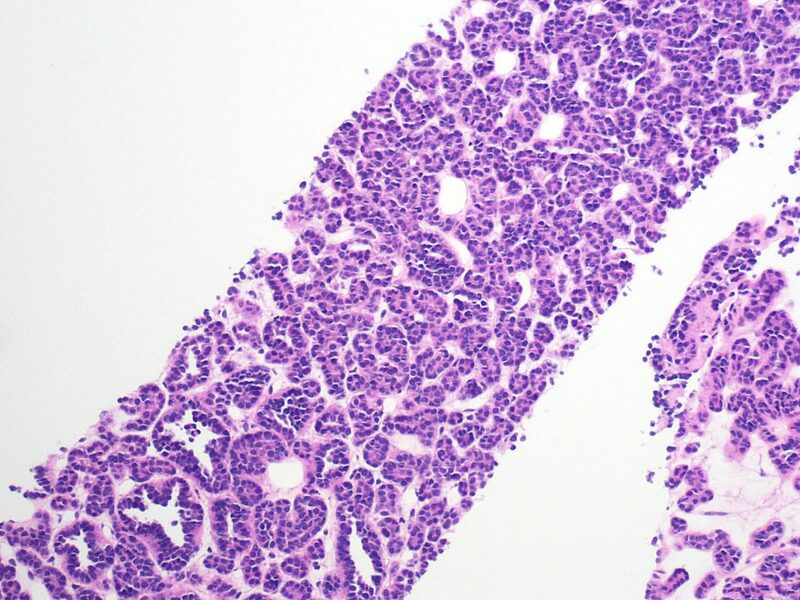 The main differential diagnoses include papillary renal cell carcinoma and Wilms tumor. By immunohistochemistry, the tumor is positive for PAX8, WT1 and CD57 but negative for CK7 and CD56. In contrast, papillary renal cell carcinoma is frequently positive for CK7 and negative for WT1. Epithelial predominant Wilms tumors show a thick fibrous capsule and the tumor cells are more columnar with frequent mitoses. Wilms tumors are positive for CD56 and frequently negative for CD57. 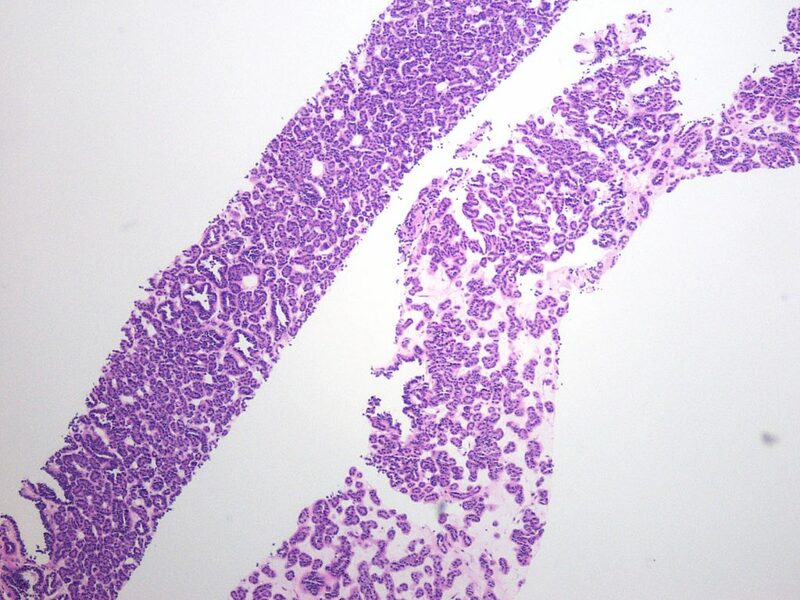 Metanephric adenomas frequently harbor BRAF mutation.